I am beginning to believe that giving of one's self is a lot harder for some then I had originally thought. I shake my head in disgust when disclosure of this one or that one who was held high for their values falls from grace. A much respected figure. But the foolery and trickery is on those of us who fail to realize that falling from grace is normal. That unless you give up one's self to the almighty God you do not have a support system in place to sustain you. The enemy is so full of lies and deception. Some turn a blinds eye and they fall for the emptiness. The absolute traps and pitfalls in place for them. God is almighty, there should be no question. He and only he is whom we should fear. 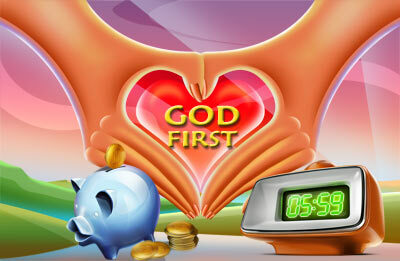 Faith in God must be first and foremost. No other should come before God not even one's self. Matthew 6:19-21 Do not lay up for yourselves treasures on earth, where moth and rust[a] destroy and where thieves break in and steal, but lay up for yourselves treasures in heaven, where neither moth nor rust destroys and where thieves do not break in and steal. For where your treasure is, there your heart will be also.